The FIRST meal in the new house. 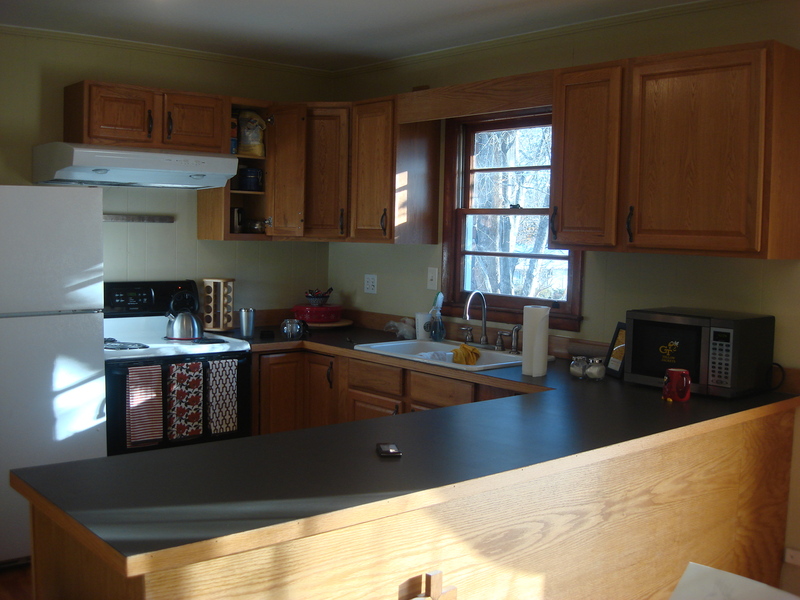 This kitchen is… so… spacious. Look!! It’s beautiful and begs to be filled with incredible smells, delicious snacks, and delectable dinners. I hope to continue in this fashion the whole year through. 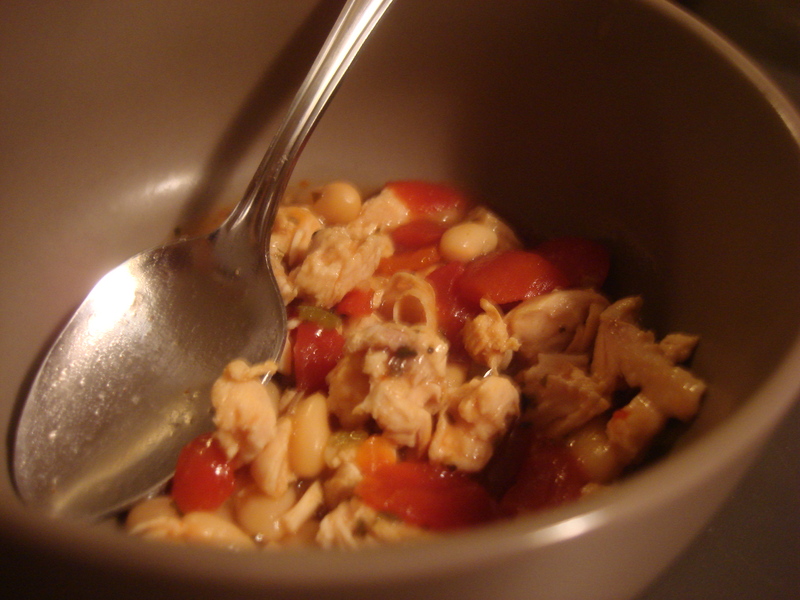 I have started with an incredibly simple and wonderful meal, because a) that’s what I was in the mood to eat, b) that’s what I was also in the mood to make, and c) so good. First, cook the chicken. 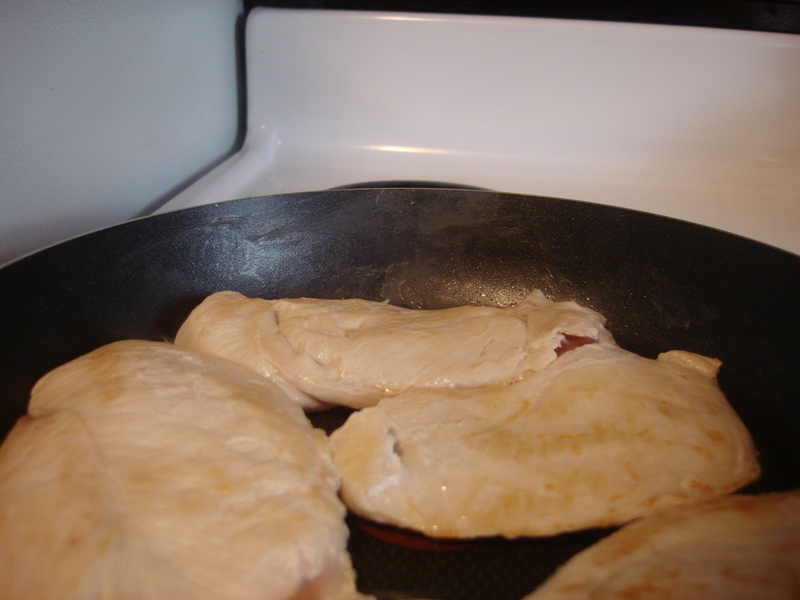 On medium-high heat until golden brown on each side. Just to make sure the chicken is as delicious as possible, I shredded it once it was mostly cooked and put it back on the heat to finish it. You can also think ahead and dice your chicken prior to cooking it. 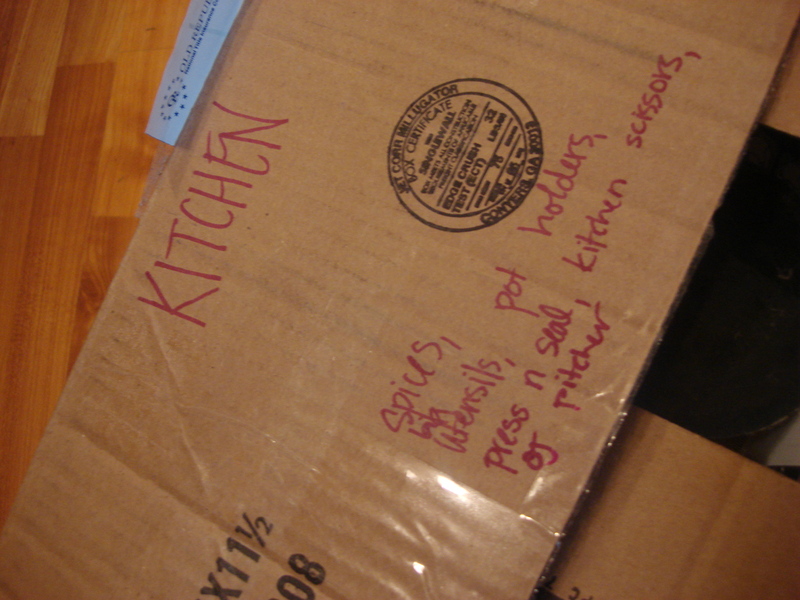 But that would take less time, and who doesn’t want to spend as much time as possible preparing for a meal?? I’m clearing my throat and trying to distract you. Look!! 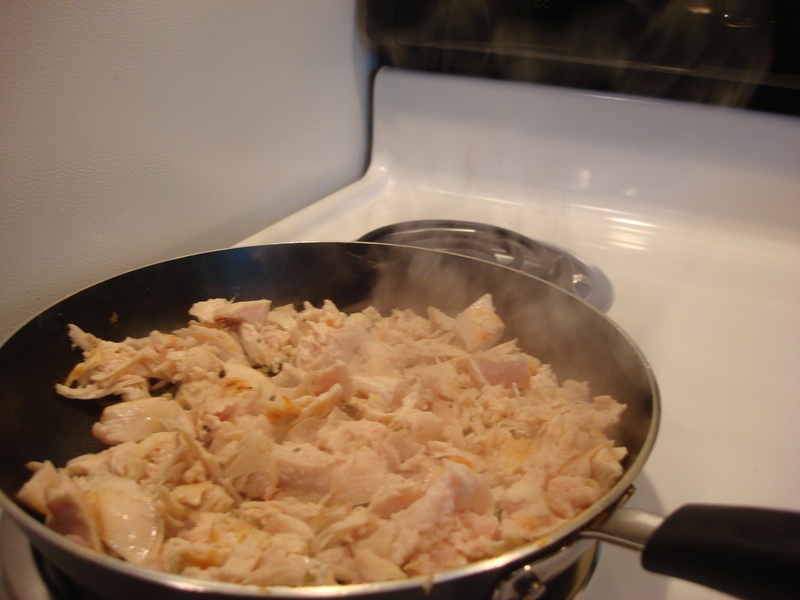 Some chicken in a pan! 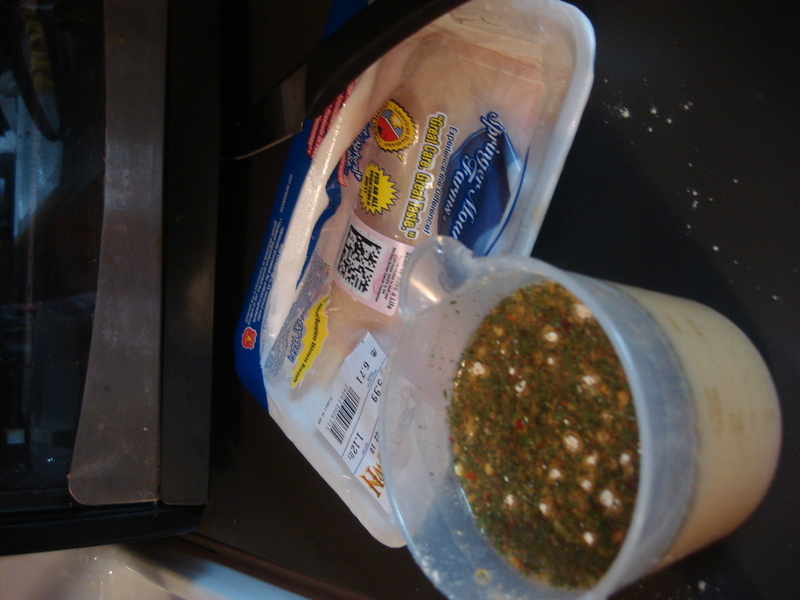 While the chicken is finishing up , mix together the water or broth with the seasoning mix. 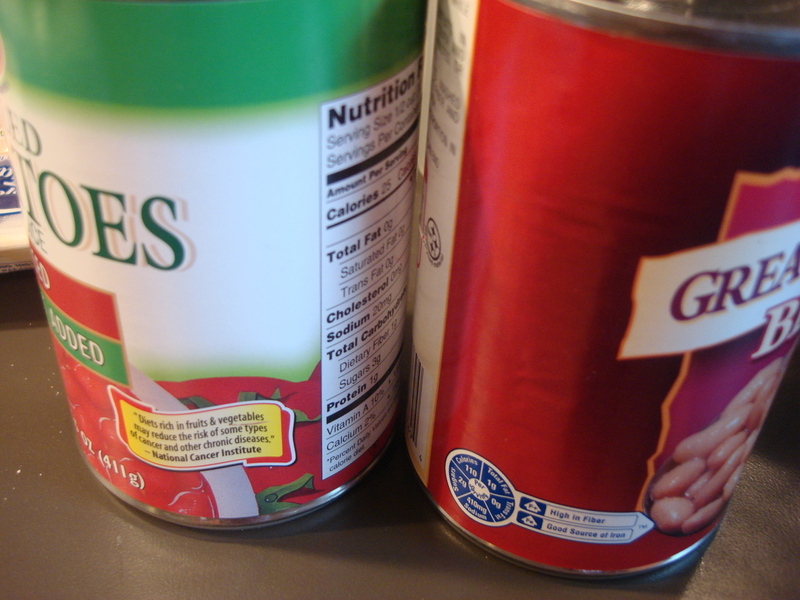 Open the cans tomatoes and beans. 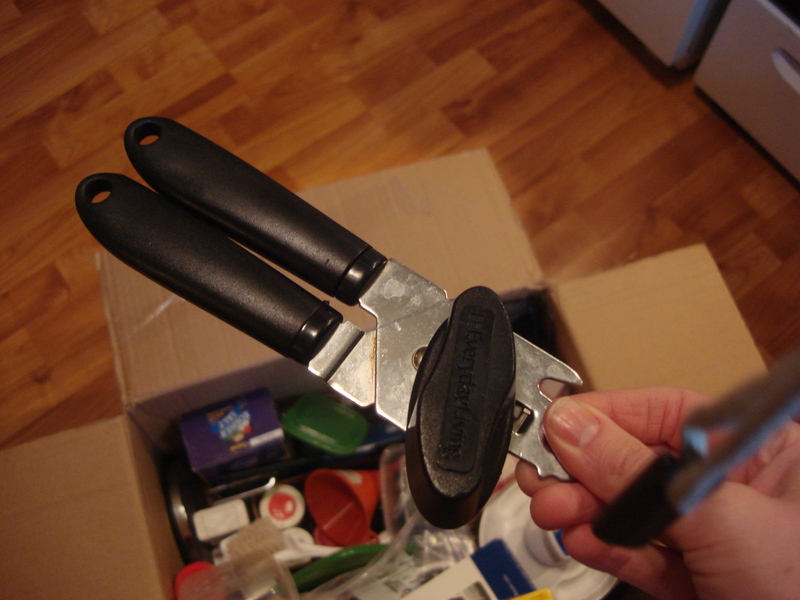 If you just recently moved, fetch the correct box from the garage, cut it open with your new house key, and rummage around for the can opener. 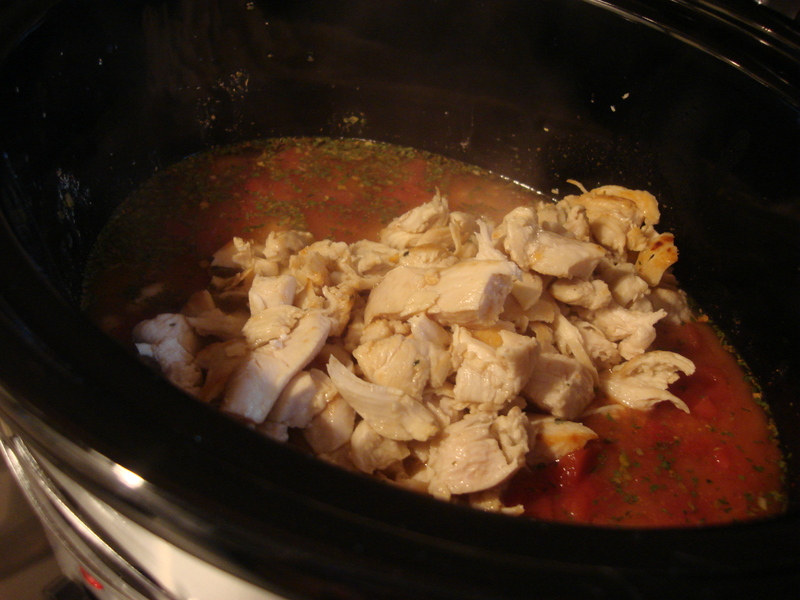 So, once you finish cooking your chicken, put the chicken, the McCormick’s/water or broth mixture, and the opened cans of vegetables into a crock pot. 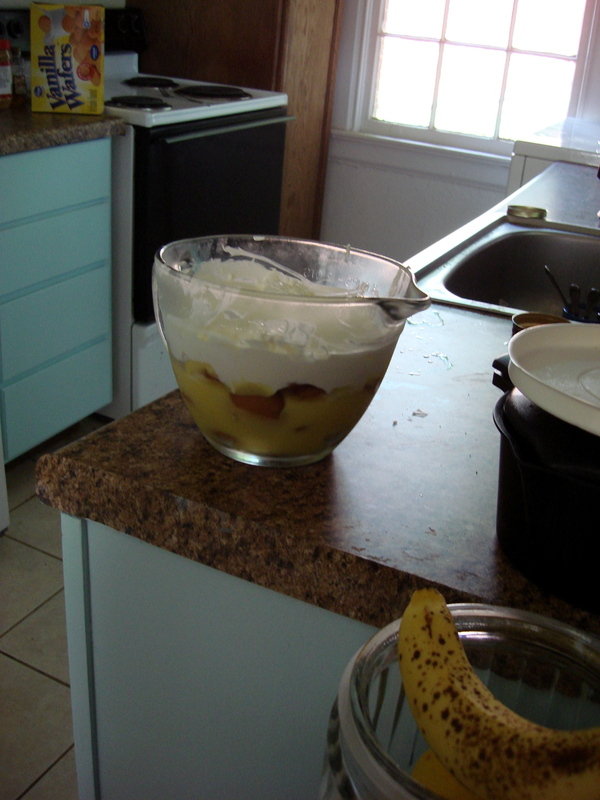 You could also simmer this in a Dutch oven for a bit. 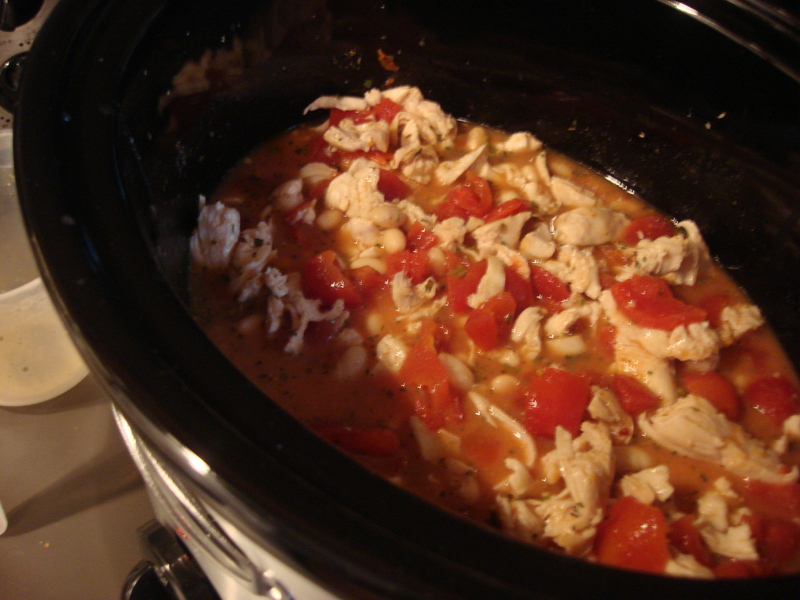 However, I found it easier just to throw it all into a crock pot and leave it be. Let it work for itself. Gain some delicious independence. Everybody wins. Once everybody’s at the party, mix them all up. Let this beautiful concoction cook for several hours on low. 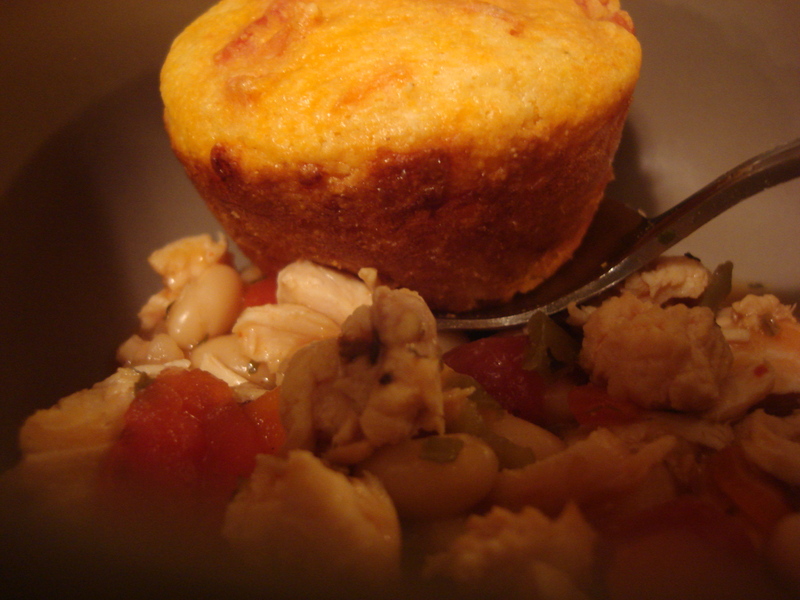 This cornbread muffin is incredible. It has cheddar cheese, tomatoes, and chiles inside it. So perfect!